« Was weaker gravity responsible for large dinosaur size? Expansion of the Universe in diagrammatic form, from the Big Bang until today. This post is most concerned with the second and third boxes from the top, before any galaxies or stars. Since the early 20th century, we’ve known the Universe is expanding: galaxies are getting farther apart and the density of stuff is getting smaller. That means in the past, the part of the Universe we observe today must have been much smaller and denser. As I discussed in the previous Alphabet of Cosmology entry, the environment in early times was very dense, with a high temperature maintained in part by collisions between photons and ordinary (baryonic) matter. Back when the Universe was very young, then, it couldn’t have looked much like it does today: no galaxies and no stars, since there wouldn’t be the right conditions for them to form. When cosmic expansion got big enough, things cooled down and the Universe became transparent. This wasn’t an instantaneous thing, but it was still relatively quick in cosmic terms: the free electrons in the plasma could join up with atoms, liberating all the photons in an event called recombination. (That’s a bit of a misnomer, since it was really the first combination, but we’re stuck with the name anyway.) Most of those photons will never hit anything again: they’ll fly in straight lines as the Universe expands, and the chances of striking another atom again are pretty slim. That’s good for us: if we build telescopes, we can detect some of these photons. In fact, if you have an old analog TV antenna, you can pick up some of those photons by turning to a blank channel: some of the screen snow you see is radiation from recombination. When these photons were emitted, the Universe was about 3000 Kelvins (4900° F). Based on our understanding of the thermal spectrum (also known as the blackbody spectrum), we know that temperature corresponds to ultraviolet light. However, the Universe—and those photons—cooled a lot since then, so the temperature now is about 2.7 K (-455° F), placing them in the microwave portion of the spectrum. 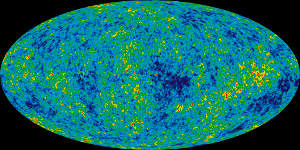 For that reason, the pervasive photons left over from 380,000 years after the Big Bang are known as the Cosmic Microwave Background (CMB). These are the contents of the Universe, of the Universe, of the U-ni-verse! The CMB reflects the contents of the Universe from a nearly its beginnings, but also the fluctuations in density, which express themselves in tiny temperature variations. However, the scale and magnitude of the fluctuations reveals the sound waves, and in turn that tells us something about the formation of galaxies…which reveals our own history. If the fluctuations had been slightly larger or smaller, the Universe would look very different than it does today. If there had been no fluctuations, we would not be here at all. These fluctuations are the source of the colors in the picture on the left, which is based on data from the Wilkinson Microwave Anisotropy Probe (WMAP), which studied the CMB for 9 years. The coloration is highly exaggerated, though: the difference between the hottest spot (marked in red) and the coldest (in blue) is on the order of 10 millionths of a degree! This is the whole sky in microwave light (albeit with the Milky Way subtracted), so you need to imagine being at the center of a globe, with these microwaves streaming toward you from all directions at once. Most of these temperature variations are smaller than the size of the Sun on the sky, and regions that seem larger are where our brains have tricked us into seeing patterns that aren’t there. Flipping a coin many times will produce “runs” with all heads or all tails that may seem to show there’s something going on beyond randomness, but it’s within the realms of ordinary probability, and that’s what’s going on in the CMB spectrum too. The next step is to take the sizes and magnitudes of fluctuations over the sky, which is the series of images below. 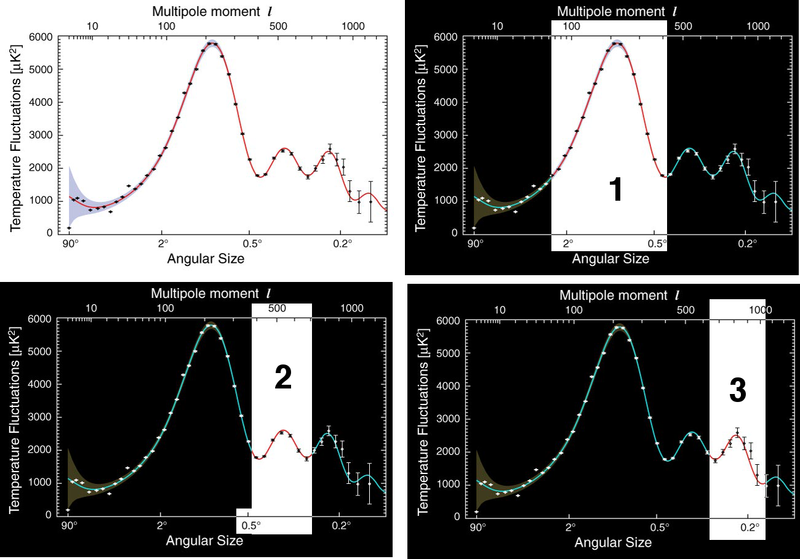 The left side of each image represents the largest scales on the sky, and as you move right you’re looking at smaller and smaller temperature fluctuations. The technical name for this is the power spectrum, since it’s a measurement of the rate of energy carried by the CMB photons as they arrive at WMAP. The three biggest peaks are key: they will tell us exactly what the contents of the Universe are! The first peak contains information about the total amount of stuff in the Universe: ordinary matter, dark matter, photons, neutrinos, dark energy, and anything else we might not know about yet. The size and location of the peak is related to the geometry of the Universe: how “flat” it is. Note that this peak covers areas of the sky much larger than the temperature fluctuations we’re seeing (the Sun is 0.5° on the sky! ), so it’s not produced by sound waves in the early Universe, but by the total energy driving expansion. The second peak is the sound waves, and tells us exactly how much baryonic matter there is in the Universe. 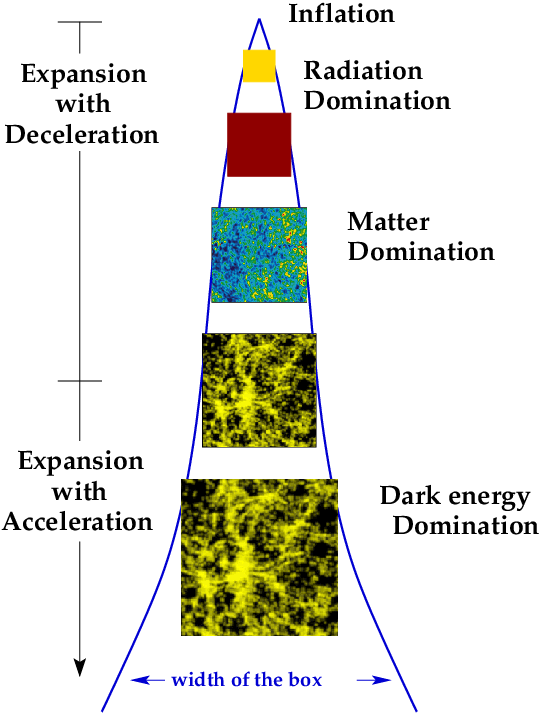 In the big-picture scheme, we might miss a specific detail that’s very important: the WMAP power spectrum is one of the most important pieces of evidence we have for the existence of dark matter. It’s independent of galaxy rotations or galaxy clusters, or specific theories about what particle comprises dark matter. What the power spectrum tells us is that 84% of matter doesn’t behave like baryons: it doesn’t experience the same pressure waves and doesn’t couple to photons. As I wrote in my recent column for BBC Future, those features rule out most of the Standard Model right there. (The remaining piece, neutrinos, decoupled from ordinary matter before recombination; I’ll have more to say about that later in the Alphabet of Cosmology. Technically neutrinos are dark matter, but they’re a minor component compared to what we usually call “dark matter”.) To me, that’s an amazing and powerful result: we can discern the presence of a form of matter that eludes detection by ordinary means, though the fluctuations in light left over from the Universe’s infancy. So if the universe is flat, is it infinite? Is it correct to say that the third peak is due to “‘ SOMETHING “” that we conclude it must exist ….we propose DM but it could be something else ? The third peak contains something that doesn’t behave like atoms, but still acts like matter. In other words, it acts like dark matter. OK, Dr Francis , but if it is not behaving like atoms , on what bases we decide that its action is like matter/particles , how can we reach this conclusion ?may it not be something beyond our grasp as per SM ?I meam beyond fields / particles concept ?